I grew up listening to hip-hop more than any other form of music. The genre itself is in one that has almost always been burdened with mythos and bravado. From it's origins as party rocking music that allowed emcees to "feature" themselves or play up various personal traits or downplaying or dissing someone else's. The genre evolved heavily in the 90s and included the development of the very popular gangsta rap. Whether it was West Coast groups like N.W.A. or the burgeoning drug-dealer turned rapper icons of Notorious BIG or Jay Z in New York. When the 1996 album Stakes is High from De La Soul dropped, it marked a substantial shift in the groups aesthetic from the keeping it like to keep it real, but really real. The song Stakes is High and the very clever video looked to strip away all the bravado and call it out for what it was, as well as acknowledge that at the end of the day, these guys were all just trying to make a living. De La Soul "Stakes is high" from Kamp Kennedy on Vimeo. The video is even more refreshing with shots of the guys doing laundry, washing their dishes and raking up leaves. You know, normal life stuff. If you're shouting about keeping it real but you're just feeding us a line of b.s about how tough you are, how many gold plated trinkets you own or how many women are falling all over you, not so much keeping it real. Today's Friday Find is about keeping it real too, and it's a bit of a surprise in terms of where it's coming from. The House Wine brand is known for making a plethora of red and white wines that are largely drinkable, fairly predictable and safe. Typically the red wines are fairly oaky and velveteen, well priced and they could be a great way to introduce non-wine drinkers to wine, that is to say, these are totally fine. That's what makes the 2011 Mountain Merlot such a shocker. From what I can glean it's a Merlot done in steel. 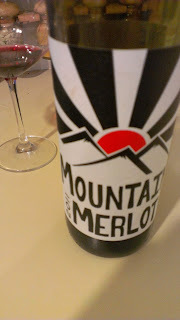 Imagine real Merlot, which usually get's worked over by a fair amount of oak allowed to be itself, to "keep it real." That's refreshing and frankly this wine is refreshing. It's crazy bright with aromatics of fresh blueberries, bright raspberry and maybe a bit of rhubarb. The wine retails at around $9.99 it's loaded up with fresh fruit and great acid. Break out the burgers for this one. House Wine is widely available so you'll wanna look out for this particular wine, it's unique among their offerings.